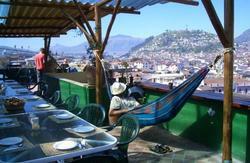 In Quito, Equador, we are the best hostel, rated * * * * by Captur (Goverment tourism department), with 25 rooms. You can enjoy a pleasant rest in comfortable and warm rooms with private bath, hot water ALL ROOMS have Cable/Tv and free WI-FI. A delicious breakfast is ready everyday to start the magic visit to our city. Hostal Jardin del Sol, offers you privacy and convenience in a friendly and Ecuadorian family atmosphere. The Mariscal is the best place to lodge at Quito. We enjoy the company of our guests. We'll be waiting for you on your next business or sightseeing to Quito - Ecuador. Mariscal Sucre's Airport is 15 minutes away from our hostel. We are near all that you need in town. Our hostel is in the middle of 6 de diciembre Ave., 10 de agosto Ave., Cristobal Colon Ave. the most importants avenues of the city. If you are looking for entertainment, you can visit the Famous Plaza Fosh, recognized all over Ecuador for its night life, the best Pubs and to know people. Buses which depart and will lead you towards different destinations like, the majesty of the Highland, beautiful beaches, natural ecological reserves and to the mystic of the Ecuadorian jungle.